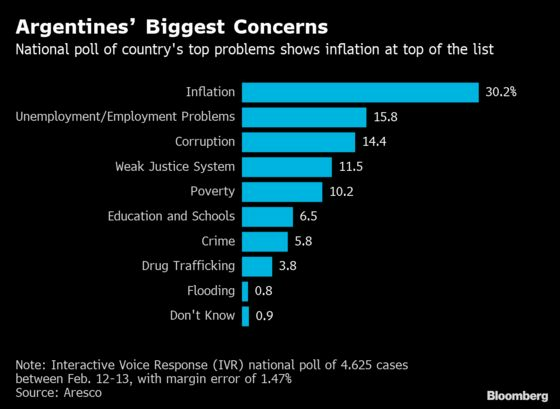 (Bloomberg) -- Argentine President Mauricio Macri is betting that lower inflation and a stable currency will ultimately matter more than economic growth to voters, a gamble that could backfire in this year’s election. Facing an uphill battle to win a new four-year term later this year, the temptation for many politicians would be to spend in order to boost consumption and put more money in the pockets of voters. But with a $56 billion bailout from the International Monetary Fund on the line, Argentine policymakers have little room to maneuver. 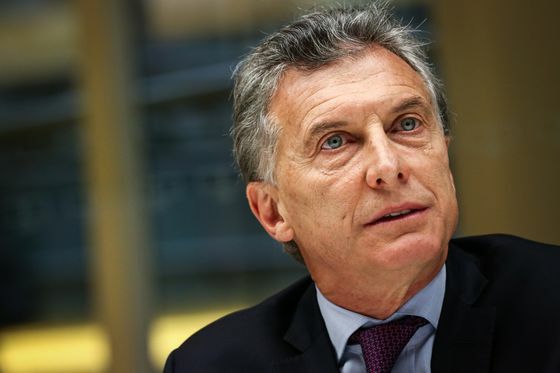 Macri is cutting spending to balance the budget this year while the central bank drains more cash from the economy and keeps the country’s benchmark interest rate above 60 percent, the highest in the world. "It’s a very risky political decision for Macri," said Walter Stoeppelwerth, chief investment officer at Portfolio Personal Inversiones in Buenos Aires. "They doubled down on their bet last week. It’ll perpetuate the recession, the economy can’t get off the mat with 63 percent rates." Argentina’s economy shrank 6.2 percent in the fourth quarter last year, according to government data published Thursday. Analysts had expected a 6.4 percent contraction. Unemployment also rose to 9.1 percent from 9 percent in the same period. It may be the responsible approach to tackle stubbornly high inflation and pave the road to more sustainable recovery going into 2020. But it could cost Macri votes and potentially the election. After a dismal 2018 when the currency fell 50 percent, Argentines see inflation hitting 40 percent in the next 12 months. The central bank reiterated its mission to fight inflation last week after higher-than-expected consumer price data and doubled down on its plan to restrict the number of pesos in circulation. While the IMF recognized that inflation has been tougher to tame than expected, the government’s efforts to balance the budget have won plaudits. "It’s a balancing act and we’re all crossing our fingers," said Siobhan Morden, head of Latin America fixed income strategy at Nomura. "Their priority is to lower FX volatility, because the only indirect way to boost consumption is a recovery in real wages through lower inflation." To be sure, the painful policies implemented by Argentine authorities come with an upside. When the government gets its hands on a $10.9 billion pay-out from the IMF in April, it will be able to sell around $60 million per day in the currency market until the end of the year in order to stabilize the peso. The IMF deal also specifically states that if "the most vulnerable" Argentines are impacted by austerity, the government may increase social spending. Macri already increased child support expenditure by 46 percent in March. Other programs may get a boost later this year. Few analysts expect Macri to stick completely to his austere budget, especially in an election year. A close contest may also force him to promise a change of tack. For many, the impact of the crisis is already very real. All the private sector job gains since Macri took office have been wiped out. Wage growth is nowhere near as high as inflation and poverty is rising again. Employers’ intention to hire in the first quarter of 2019 was at its lowest level in 12 years, according to a survey by U.S.-based research firm ManpowerGroup. 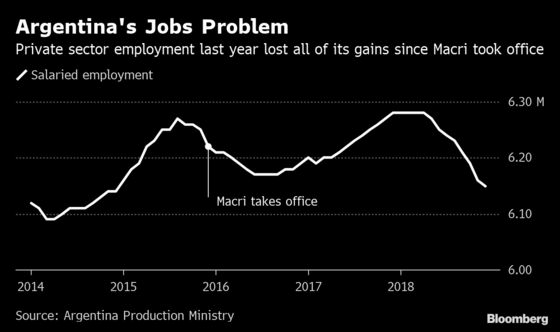 Argentina’s factories bear witness to the deep recession. Already facing steep business taxes and the highest labor costs in Latin America, manufacturers like Freddy Carfora are burning through savings just to keep the lights on as electricity bills soar, sales tank and credit remains out of reach. Carfora’s shoe factory is down to a dozen full-time employees, the lowest in the family business’ 55-year history. Half of his leather suppliers have shuttered in the past year while costs doubled. "It’s the longest crisis that I remember," Carfora, 48, said at the Agua Patagona factory outside Buenos Aires. "We don’t see a way out, we don’t see things improving in the short term." Despite the economy, his chances in October may hinge more on his opponent than the recovery. Macri’s re-election bid would be complicated if the fragmented opposition manages to unite. Investors are watching closely. Any signs that Macri may lose could spark a sell off of the country’s bonds and currency on fears of populist former president Cristina Fernandez de Kirchner returning to power and reneging on debts or on the IMF package. Macri’s government "can’t keep losing ground or increasing Argentines’ discontent,” said Federico Aurelio, director of Argentine polling firm Aresco. "There’s no miracle option."